Irving Berlin is said to have denied that the obvious double entendre in the title of this song was intentional, and it may well have been. Whether you choose to believe him or not, he said that the dance craze -- and we think he meant dancing in the sense of couples holding onto each other and dancing to ragtime music, something that was really quite new in 1911 -- had begun and that he wanted to write something to take advantage of the opportunity. So, as he said, "Doin' It" refers to dancing. 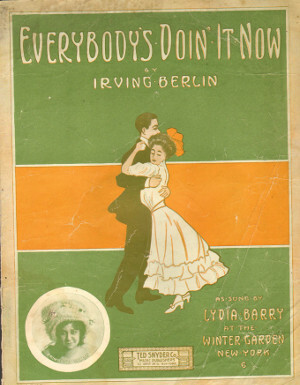 We are happy to offer the original sheet music of Everybody's Doin' It Now for download as a PDF file. The download includes the colorful original cover, and the price is $3.50. Charge it to your credit card or PayPal account. Thanks to the Library of Congress, you can stream the Victor Record recording of this classic. The performers here are the duo Collins and Harlan (Arthur Collins, baritone, and Byron G. Harlan, tenor).